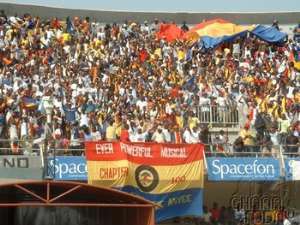 CAF Confederation Cup finalists, Accra Hearts of Oak, are likely to lose One Hundred Thousand Dollars from the prize from the tournament for apparently refusing to wear the logo of local cellular giant, Spacefon Areba, which had bought the rights for the two leg finals. Accra Hearts of Oak are reported to have been informed in advance by the continental soccer body to emboss the Spacefon logo on their shirts for the first leg of the finals played at the Ohene Djan Sports Stadium last Sunday. CAF's threat follows a strongly worded protest letter to CAF from Scancom Ghana Limited, operators of the spacefon demanding a refund of the sponsorship money paid to CAF for the finals. CAF has therefore asked the Ghana Football Association, (GFA) to seek an explanation from Hearts of Oak why they did not wear spacefon embossed shirt last Sunday. But an official of Hearts of Oak told Happy FM sports that they are not aware of the letter from CAF or the GFA instructing them to wear the Spacefon logo. As a fall out the incident, the management of the Spacefon is likely to throw overboard moves to sponsor the club reported to worth one billion cedis for season. A source at the company says the top management is not enthused about the behaviour of Hearts.